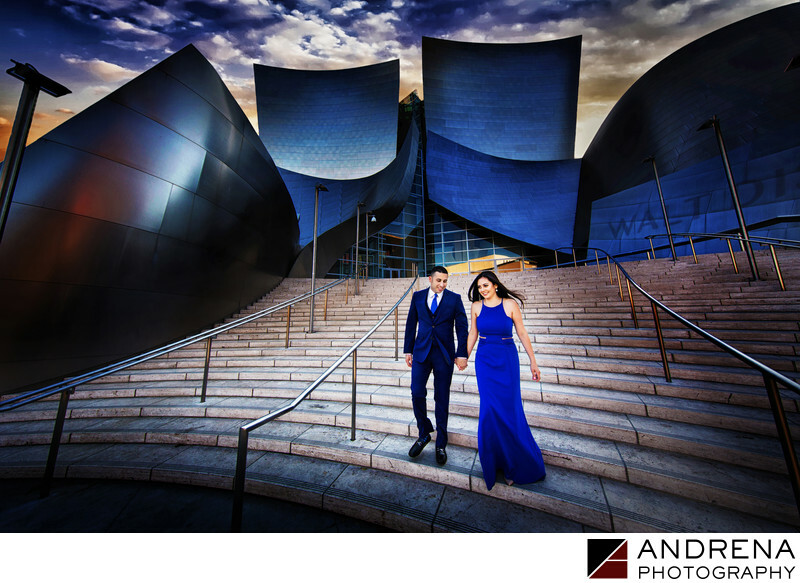 Photographing an engagement session at Disney Concert Hall provides endless options for a creative eye. The glorious metal structure seeps up into the sky in such a beautiful way, and engaged couples love having their couple session here. For this image, I added a cloudy sky and enhanced the building's silver tones by changing them to a blue hue that matched the bride's dress. The end result is a stunning view of the building where the couple are highlighted. This type of Photoshop work takes many hours and not every image benefits from this type of enhancement. But I do love how this one came out. Just another day as a Los Angeles photographer working in this beautiful city.